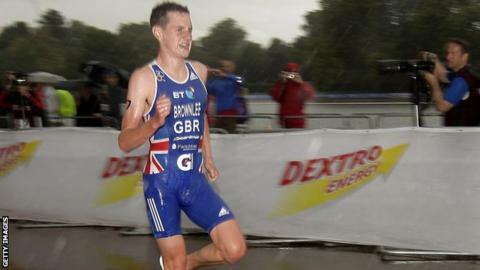 Great Britain's triathlon world champion Alistair Brownlee has suffered a tear to his Achilles just six months before the Olympic Games. The 23-year-old from Yorkshire must now wear a protective boot for a month. "If I can get this boot off quite quickly and get training, I can get myself fit in time [for the Olympics]," Brownlee told the Metro newspaper. Brownlee is expected to compete next at the San Diego World Triathlon Series event in May. Malcolm Brown, one of Brownlee's personal coaches and British Triathlon's Olympic performance group manager, said: "Alistair has a small tear in his left Achilles tendon and is wearing an air cast as a precaution. "He is swimming every day, and will train on a static bike today. He has been doing some light running, but now that he's wearing the cast, we will allow the Achilles to repair before resuming light running again, hopefully within the next 10 days. "Alistair's first planned major race is the ITU World Triathlon San Diego in mid-May. We had never intended that he would race the World Triathlon Series event in Sydney in April, so he still has three months to prepare for that." Brownlee is the reigning world and European champion, having beaten younger brother Jonny into second place for the world title in Beijing last year.